Trophy Case Sports Sarah Nordheim manages the website for Trophy Case Sports, a sports memorabilia store located in Beavercreek, Ohio. She has asked you to work on creating a script for a shopping cart page. The script should take information on the items that the customer has purchased and present in it table form, calculating the total cost of the order. A preview of the page you will create is shown in Figure 10-35. 1. Use your editor to open the tc_cart_txt.html, tc_cart_txt.js and tc_order_txt.js files from the htm10 case 1 folder. Enter your name and the date in the comment section of each file, and save them as tc_cart.html, tc_cart.js and tc_order.js respectively. 2. Go to the tc_cart.html file in your editor. Directly above the closing </head> tag, insert script elements to link the page to the tc_order.js and tc_cart.js files in that order. Defer the loading and running of both script files until after the page has loaded. 3. Scroll down the file and directly below the h1 heading titled "Shopping Cart" insert a div element with the ID cart. 4. Save your changes to the file and go to the tc_ordet.js file in your editor. 5. Within the tc_order.js file, you will create arrays containing information on a sample customer order. Create an array named item that will contain the ID numbers of the items purchased by the customer. Add the following four item numbers to the array: 10582, 23015, 41807, and 10041. 7. Create an array named itemPrice containing the following item prices: 149.93, 89.98, 334.93, and 22.67. 8. 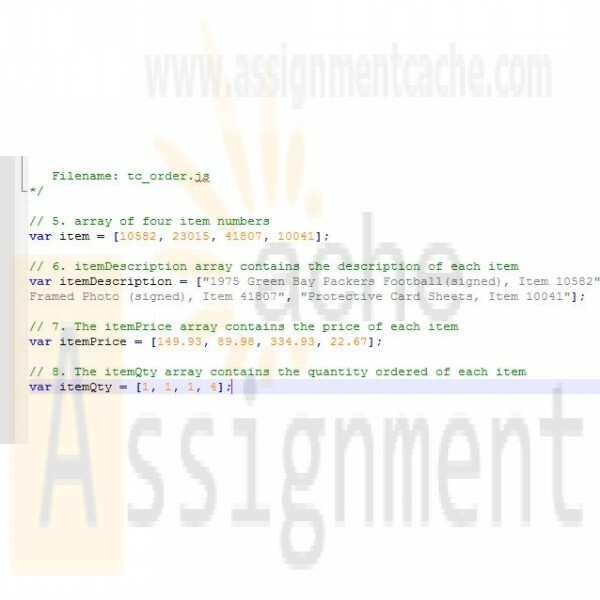 Create an array named itemQty containing the following quantities that the customer ordered of each item: 1, 1, 1, and 4. 9. Save your changes to the file, and then open the tc_cart.js file in your editor. 10. In your script, you will calculate a running total of the cost of the order. Declare a variable named orderTotal and set its initial value to 0. 12. Create a for loop that loops through the entries in the item array. Each time through the loop, execute the commands described in Steps a through e.
where item is the current value from the item array. 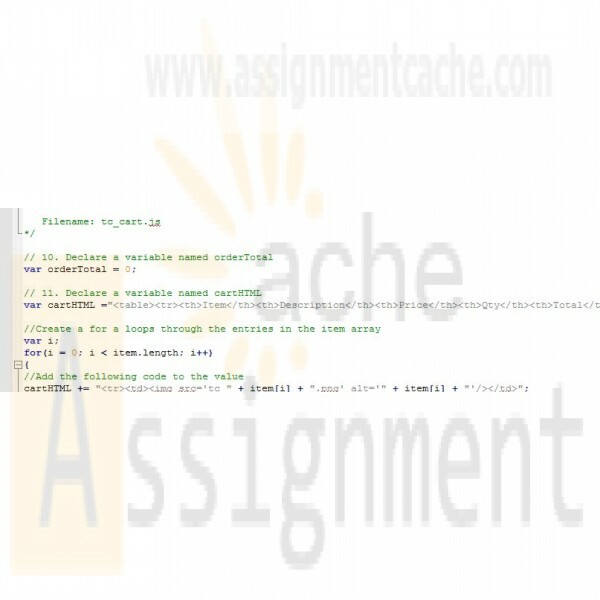 where description is the current value from the itemDescription array, price is the current value from the itemPrice array preceded by a $ symbol, and quantity is from the itemQty array. c. Declare a variable named itemCost equal to the price value multiplied by the quantity value for the current item. where cost is the value of the itemCost variable, preceded by a $ symbol. e. Add the value of the itemCost variable to the order Total variable to keep a running total of the total cost of the customer order. where total is the value of the orderTotal variable, preceded by a $ symbol. 14. Apply the cartHTML value to the inner HTML of the div element with the ID cart. 15. Document your script file with appropriate comments, and then save your work. 16. Open the tc_cart.html file in your browser and verify that the page now shows the shopping cart data for the sample customer order.